A snowstorm hit the Pines on April 2, 2018, turning spring into a winter wonderland at The Co-ops. 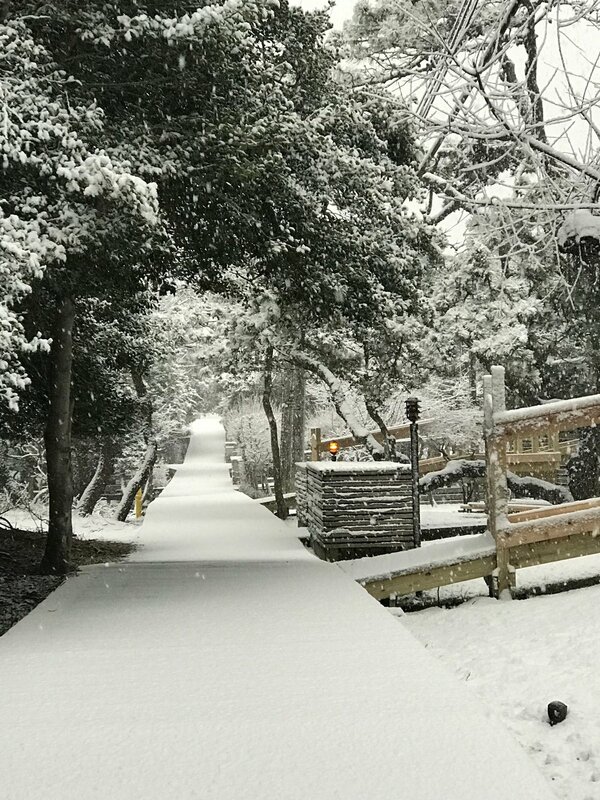 A strong “bomb cyclone” nor’easter that hit the east coast of the United States on March 2, 2018, created only minor damage to the Pines, according to The Fire Island Pines Property Owners Association. While beach erosion did occur, and more unusually high tides were expected, FIPPOA stated that it appeared to be normal or at least no worse than other large storm damage. Fire Island Blvd is completely underwater after a nor’easter hit the East Coast on March 2nd. "As you are aware, the Sayville Ferry has not been running boats since 1:50 pm yesterday. With the difficulty in getting to the Pines and the continuing high winds, it is not easy to get first hand accounts of the impact of the storm in the Pines. Early this morning, the harbor walks were flooded (see below). Needless to say, there is high water everywhere and Fire Island Boulevard is flooded. At Nautilus, the ocean came over the dunes up to Ocean Walk. The ocean continues to be high and is very rough. There was also a broken power pole between Floral and Tarpon. As more reports become available, we will keep you posted." 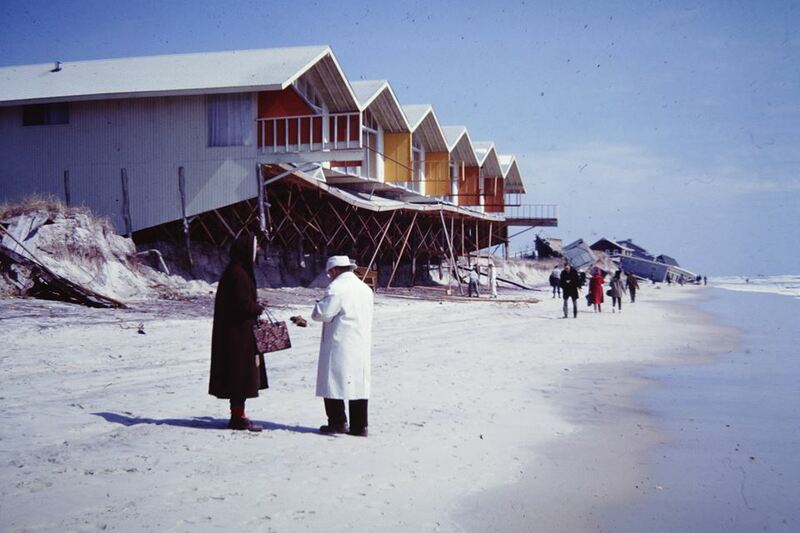 This is a picture of The Co-ops after a hurricane in 1962 (probably Daisy) that appeared on the Facebook page of the Fire Island Pines Historical Preservation Society. As we express our sympathy to the victims of Hurricane Harvey, and are watching the track of Hurricane Irma, we are reminded of the damage that even a weak storm system can have on Fire Island. FIPPOA has announced that the freight dock, which will be renovated this fall, will be closed for new deliveries as of October 1st. Residents who plan on shipping items to the island should do so by the end of September. * The Early Fall schedule will be extended one week to include all of September. Previously it had ended the third week of September. * An extra boat will be added leaving Sayville on Monday September 11th at 7:10pm and the Pines at 7:55pm. This is to accommodate the large amount of people who stay out through Monday that second week of September. * Although there will be no west bound train from Sayville to meet the 7:55pm boat, Colonial taxi has been alerted to take people to the Ronkonkoma Station. * There will be a late Thursday ferry throughout September leaving Sayville at 7:30pm. * On Mondays the 10:30am boat will change to leave Sayville at 10:25am giving the return at 10:55am more time to connect with the LIRR. * On Sundays one additional boat has been added at 7:50pm and thru September 17th there will be an additional boat at 8:50pm. * The Fall schedule will be extended one week through October 29th. * An additional boat will be added Monday thru Thursday leaving Sayville at 5:10pm. * On Thursday October 5th, there will be an additional boat leaving Sayville at 7:30pm. * The 10:15am boat throughout the week will change to 10:10am giving the return at 10:55am more time to connect with the LIRR. * On Fridays, the 12:15pm boat will leave Sayville at 12:10pm giving the returnfrom the Pines at 12:55pm more time to connect with the LIRR. * On Columbus Day Weekend an additional boat will be added on Friday leaving Sayville at 5:30pm. * For all of October there will be an additional Saturday boat leaving Sayville at 5:20pm. Sayville Ferry Service has promised that if this additional service works then more service will be added for next spring and fall." There will be an important shareholder meeting on Saturday, September 9th at 11:00 AM at Whyte Hall Community Center. All shareholders are urged to either attend in person or by proxy. (You may obtain a proxy from Prestige by writing to pmc991@aol.com. Proxies are also located in the site office.) Because we didn't have a quorum at the spring shareholders meeting, elections for the Board of Directors had to be postponed to the fall meeting on Sept. 9th. As usual, a light breakfast will be served. See you there! History of The Co-ops is online! Two of several images on the Fire Island Pines Historical Preservation website about the early days of The Co-ops. Note the height of the dunes in the photo above! REMINDER: Planters Must Be Elevated Off The Deck! Shareholders are reminded that all pots and planters MUST be elevated off the wood decks according to House Rules. Pot risers, pictured here, are an inexpensive solution to raising your planters off the deck. Available on Amazon.com. The Co-ops have received a large reimbursement of FEMA insurance premiums. The corporation filed corrected paperwork about the buildings, resulting in a total reduction of $35,000. This was a happy surprise for The Co-ops! The funds will revert to the general operating budget for the year. Ronnie Guha (left) and Nick Christodoulou (right) are two of our new shareholders in Unit 136. Please welcome them to the community! Although the Spring Shareholders meeting on June 4th did not achieve a quorum, an unofficial meeting was conducted at the Whyte Hall Community Center. No election for seats on the Board of Directors was possible without a quorum, so the election was postponed to the fall shareholders meeting in September. - Our signage around the property is going to be replaced soon. - Our 2017 year expenses are budgeted at $1,371,000, up $37,000 from last year. Most of the budget, including the increase, is due to insurance, repairs, and maintenance. Shareholders will pay $25.43 a share in maintenance for the year. We have $160,000 in our reserve fund. - Beachscapes will take care of our grounds again this season. We lost 7 trees in 3 winter storms. - The FIre Island Pines Property Owners Association (FIPPOA) reports that discussions are underway about expanding the fall ferry schedule. Also, they are exploring the possibility of burying the power lines throughout the Pines. Shareholders were urged, once again, to join FIPPOA. - The Dune Replenishment program is now expected to begin in the Pines in the spring of 2018, and go through next summer. Shareholders listening to the Managing Agents report at the (non)meeting on June 4th. The Fire Island Pines Property Owners Association (FIPPOA) announced that the Harbor reconstruction project should be finished by the end of April. The Sayville Ferry will be docking outside The Pantry until the renovation of the pier is complete. In order to control arrivals and departures from The Pantry location, FIPPOA is asking arriving passengers to go to their left as they disembark and follow directions of the dock hands. Departing passengers are asked to use Pickety Ruff Walk to get to the ferry, and stay on the north side (beyond Bay Walk) to wait to board the ferry. Additional benches have been placed on the north side of The Pantry for your convenience. Anticipated completion date for the pier is April 28; we will keep you updated here about developments. The Co-ops will open for the 2017 season on Friday, April 21. Shareholders should download their Opening Package and contact Prestige Property Consultants if they intend on opening that weekend to make sure that their unit is ready. MEET OUR NEWEST SHAREHOLDER: FREDDIE THE FOX! Freddie The Fox has been visiting The Co-ops regularly this spring. "The shareholder will be subject to a fee equivalent to the established rental registration fee for a long-termrental, defined as a rental over 45 days, if there is usage of the co-op unit by guests in the absence of the shareholder for more than a total of 20 days." Winter Work Wonderland: Lots of Replacements! The staff is busy this winter with work on replacing five garbage stations along Atlantic Walk, replacing the walkway leading to the Office, replacing15 shut off valves, 30 stair treads, and a sub floor and floor in the office, as well as the downspouts that stick out on the south side of the B building. FIPPOA reports that the dune restoration project is largely complete in the western part of Fire Island through Ocean Beach. The eastern communities are the next phase, with final real estate work being completed by the Army Corps of Engineers and the County. The federal government has allocated $68 million for this real estate work, which pays for everything from easements to entire houses that have to be moved. We are told that the project will reach Fire Island Pines in September. A warm welcome to our newest shareholders: Lewis Greenwald in Unit 123; Kevin Mathis in unit 140, and Nicolas Christodoulou (above on left) and Ronnie Guha (above on right) in unit 136. Asked why they decided to buy a co-op, Nick said “…we really missed the Pines and all our friends there.” The fact that The Co-ops permits dogs helped them decide to look into buying a unit. They used to play beach volleyball every day, and enjoy travel, good food, and meeting new people. In fact, they’ve invited you to meet them: “Please feel free to stop by and say hi” when you’re out in the Pines this summer! Former long-time employee of The Co-ops, Richie Ellison, had a diabetic seizure and stroke in Florida days after his 46th birthday. He is in serious need of financial help. A GoFundMe campaign has been started by Annie and Ed Candreva.